Re-Introducing our Best Selling Pocket Holster with Suede-Like Outer for Superior Pocket Retention. With the Concealment Pocket Holster, you carry your gun concealed in the most comfortable, convenient way. The Concealment Pocket Holster is constructed from high-tech closed-cell waterproof foam padding for a comfortable carry and to protect the gun from moisture. 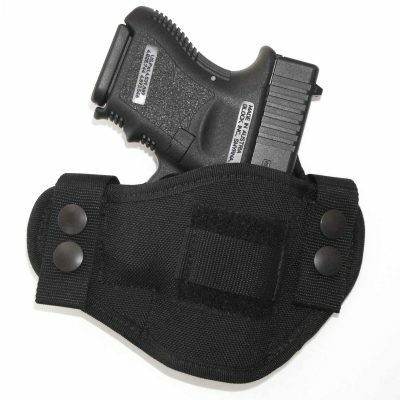 Heavy-duty, suede-like material on the outside helps keep the holster in place in the pocket. This material grips the pocket lining for a secure hold. Lined on the inside with smooth Cordura® nylon for durability and an easy, fast draw. This special material is made exclusively for Active Pro Gear. This card reveals, step-by-step, exactly what to do after the confrontation ends and the confusion begins. It contains vital information to protect you! If you carry a gun for protection, you can’t afford to be without this card in your wallet or purse. Now you can get this card absolutely free, just by trying the Concealment Pocket Holster—at no risk to you! E.R., West Memphis, AR I've tried many different concealment holsters for my AMT .380 Backup and for my S&W Model 37. I was not really satisfied with any of them. Recently, I tried your pocket holster. That's the one I am going to use from now on. It is easy to use; holds my gun in place and leaves very little 'print' on my pant pocket. Best of all, your holster is reasonably priced. Thanks. J.R.K., Midlothian, VA I just ordered and received the 64S Pocket holster for my Seecamp .32. It fits even better than I thought possible. When I went to the mailbox and got out the envelope I thought it might not even be in there. Then when I opened it up and realized that some of the thickness was in the extra papers you sent as advertisements with it I was thrilled! What a great design. Thank you for providing me an inexpensive way to keep my gun clean and readily accessible. H.J. Great quality holster, It is a "little stiff", but I prefer it to the "softer fabric ones, as it protects the laser a lot more when in the pocket. I bought this for the "new" RM380 with CT laser-----looking at the ad picture, with the RM380, the rear sights are even with top of the holster, the trigger guard is "half exposed" but the trigger well protected and inside the holster. Do not buy this for the RM 380 if want the item to fit in the holster the same as the one in the picture. I knew this holster was for the slightly smaller 380's when I purchased it, so the fit for me was no surprise. Very pleased!!!!!!!!!! Very happy to see this pocket holster available again, i have an original one from 6 years ago still in use, and have just placed an order for my new P365! Order shipped same day, and was received quickly. Very happy with it so far. I like it. Good product. Stays in the pocket every time as expected. Excellent product, have recommend to friends . I use size 64C with my Beretta NANO. Bought this model and one from a competitor. Your model 64 has won the competition and is the keeper. Great product!